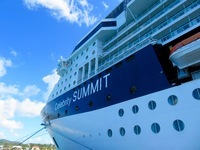 This was our third cruise, second time on Celebrity, and first time on the Summit. 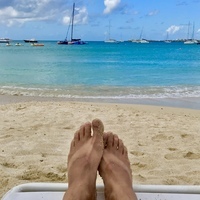 We were on a port intensive cruise (San Juan to St. Croix, St. Maarten, Dominica, Grenada, Barbados) with only 1 true sea day, so we spent a lot of time off ship. 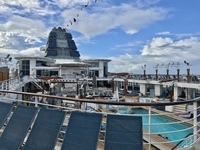 Overall, the cruise was good and we enjoyed each of the ports. On the ship, food was just "ok" and entertainment was lacking. More details below. Embarkation: Painless. From the moment we stepped out of our taxi at the Pan American Pier to the moment we were in our stateroom, only 15 minutes had elapsed. And we have no special "perks" or "status." Just luck I guess. Our room was ready when we got on board. Service: Great service from Ryan, our cabin steward. He works like a magician, that guy! Also enjoyed our wait staff in the MDR from Tammy and Kelvin. Took time to explain menus and suggest items. Had to make 3 trips to Guest Relations because we kept de-magnetizing our seapasses. Service was quick and friendly. They also happily exchanged some larger bills for smaller bills for us. Food: T﻿his is highly subjective, so take it with a grain of salt. I wouldn&apos;t say I would rave about the food here (last year on Celebrity Equinox we had a 3-night specialty dining package--so it&apos;s unfair to compare). This year, we ate all dinners in the ﻿MDR. I had two things I would rank as "excellent" -- the braised beef ragout with gnocchi as a starter (I could have eaten plates and plates of it as a main) and the slow braised lamb wrapped in phyllo. There were a couple misses: the seafood in the Mediterranean seafood orzo was chewy (a la rubber bands) as was the sirloin steak. I also had the teeniest tiniest chocolate lava cake I&apos;ve ever had. Breakfast was good in OVC, but lunch found me circling a couple times to pick something out and I&apos;m not picky. Pizza in OVC could be good...or not. Sometimes nice and crispy, other times greasy and limp. But I didn&apos;t have to cook for a whole week! ﻿ Facilities: This was the smallest ship we&apos;ve been on and found it naturally easy to navigate. It did not feel crowded at all! Easily found open tables in the OVC. It was easy to get on and off in each port. There was some evidence of the need for the dry docking. Carpet frayed here and there. You could tell our balcony probably needed scraped of the many coats of paint and be redone. There generally wasn&apos;t a problem getting a chair in the pool area if you wanted some sun...or even some shade too. Because this itinerary was so port intensive, we didn&apos;t have time to enjoy as my areas as we have done on previous cruises. Onboard Activities: Again, since this cruise was so port intensive we were not expecting a lot. And in return, Celebrity did not provide a lot. The singers and dancers are always good, but we the plot-less shows can get kind of repetitive. Neither of the comedians were funny to us, but we like edgier humor and that doesn&apos;t really match us with Celebrity&apos;s demographic. The magician/comedian (how about pick one!) was awful. On the plus side: We really enjoyed the live music. Since the cruise left from San Juan, there was more Latin music...another plus for me. Disembarkation: Super simple. Walked off when our group number was called. Luggage was already waiting. Line moved fairly quick for Customs and Immigration and then again to get a taxi. 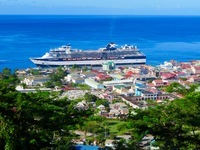 Ports… St. Croix: Sundays in St. Croix are SLEEPY. So be advised to plan an excursion as a lot of shops are closed. We enjoyed our island tour though. 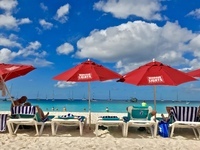 St. Maarten: We did a beach day here. No complaints. Kim Sha Beach at Simpson Bay is a nice area. Very relaxing! 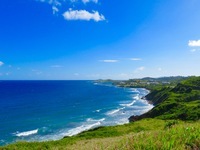 Dominica: Beautiful green and verdant island. 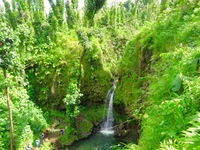 Really loved our rainforest/waterfall excursion. Some of the scenery reminded me of Hawaii. 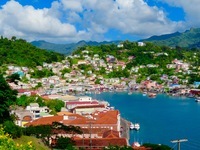 Grenada: Similar to Dominica in being green and pretty. Loved our river tubing adventure. Would not hesitate to do that again. Barbados: We did another beach day here. Harbour Lights at Carlisle Bay has a fantastic stretch of sand with crystal clear water. 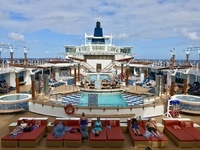 This was our third cruise, second time on Celebrity, and first time on the Summit. 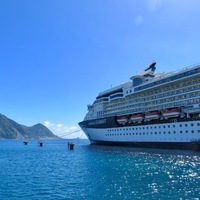 We were on a port intensive cruise (San Juan to St. Croix, St. Maarten, Dominica, Grenada, Barbados) with only 1 true sea day, so we spent a lot of time off ship. 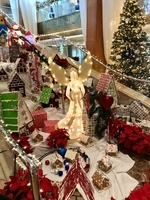 Overall, the cruise was good and we enjoyed each of the ports. On the ship, food was just "ok" and entertainment was lacking. More details below. Embarkation: Painless. From the moment we stepped out of our taxi at the Pan American Pier to the moment we were in our stateroom, only 15 minutes had elapsed. And we have no special "perks" or "status." Just luck I guess. Our room was ready when we got on board. Service: Great service from Ryan, our cabin steward. He works like a magician, that guy! Also enjoyed our wait staff in the MDR from Tammy and Kelvin. Took time to explain menus and suggest items. Had to make 3 trips to Guest Relations because we kept de-magnetizing our seapasses. Service was quick and friendly. They also happily exchanged some larger bills for smaller bills for us. Facilities: This was the smallest ship we&apos;ve been on and found it naturally easy to navigate. It did not feel crowded at all! Easily found open tables in the OVC. It was easy to get on and off in each port. There was some evidence of the need for the dry docking. Carpet frayed here and there. You could tell our balcony probably needed scraped of the many coats of paint and be redone. There generally wasn&apos;t a problem getting a chair in the pool area if you wanted some sun...or even some shade too. Because this itinerary was so port intensive, we didn&apos;t have time to enjoy as my areas as we have done on previous cruises. Onboard Activities: Again, since this cruise was so port intensive we were not expecting a lot. And in return, Celebrity did not provide a lot. The singers and dancers are always good, but we the plot-less shows can get kind of repetitive. Neither of the comedians were funny to us, but we like edgier humor and that doesn&apos;t really match us with Celebrity&apos;s demographic. The magician/comedian (how about pick one!) was awful. On the plus side: We really enjoyed the live music. Since the cruise left from San Juan, there was more Latin music...another plus for me. Disembarkation: Super simple. Walked off when our group number was called. Luggage was already waiting. Line moved fairly quick for Customs and Immigration and then again to get a taxi. Spacious, comfortable bed and pillows, couch, good storage. Quiet--never heard any noise from above or next to us on either side. Balcony space was nice...we spent a lot of time out there. A slight smell coming from the shower drain and a couple of the shower tiles were cracked. We also knew that the ship was scheduled for dry dock soon. Great location, easy access to elevators. I thought being more forward in the ship we might feel more motion, but all was calm. Shuttled to Harbour Lights on Carlisle Bay. I think this was one of my favorite beaches EVER. The sand is like sugar--super soft. The waters are calm and clear and it&apos;s a gradual drop off. Would definitely go back here again. This tour was called "Dominica&apos;s Favorites." We made stops at Trafalgar Falls and Emerald Pool. The scenery is fantastic and it reminded me of Hawaii. Very enjoyable! 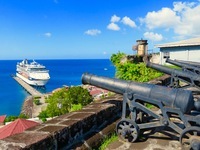 One of my 2 favorite islands on our cruise itinerary. Wonderful time on an adventure river tubing excursion. River was just enough of an "adventure" to be fun, but not scary! Would definitely do this again One of my 2 favorite islands on our cruise itinerary. Love Old San Juan! It&apos;s easily walkable. 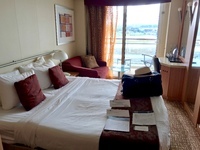 We spent one night pre-cruise at the Sheraton Old San Juan. We walked the streets and toured the Castillo San Cristobal fort. Enjoyed being shuttled around the island to see the sights and learn about the natural and cultural history of the island. This port stop was on a Sunday, so be advised that most shops will be closed. We were given one hour to tour around Christiansted on our own. Was shuttled to beautiful Kim Sha Beach on Simpson Bay. Had front row beach chairs, and we paid $4 for an umbrella. Also included a good lunch at the beach restaurant. Waters were warm, calm, and it had a very gradual drop-off.